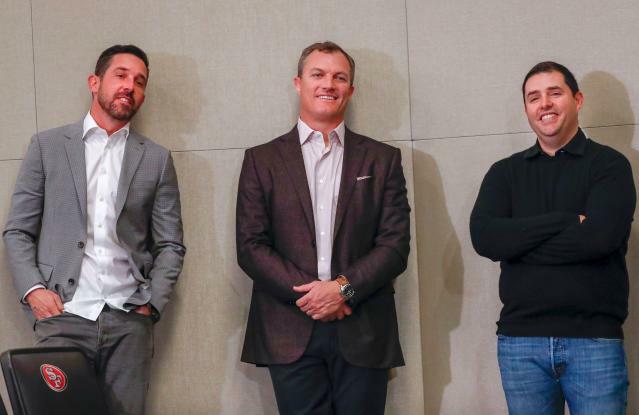 The San Francisco 49ers struggled to get four wins last season, yet team CEO Jed York is sticking with head coach Kyle Shanahan and general manager John Lynch. The two are 10-22 overall in their two years together and York said he has patience that they’ll turn it around. York’s nine-year track record with coaches is heavy. Jim Harbaugh was fired in 2014 after 64 games spanning four seasons. He led the team to three consecutive NFC championship games and a Super Bowl appearance in 2012, but after an 8-8 showing he was out after 2014. Assistant Jim Tomsula spent a year as head coach, then Chip Kelly took a spin at it for a year before York hired Shanahan for the 2017 season. Shanahan and Lynch signed six-year deals. York told The Athletic on Sunday, in his first public comments to reporters since last year’s owners meetings, he feels “even better” about their dynamic now than then. Shanahan and Lynch oversaw a 6-10 campaign in 2017 and a 4-12 one in 2018. The defense was one of the league’s worst in points allowed last season and the offense ranked toward the bottom in points scored. Otherwise, statistically, the 49ers ranked in the middle of the league. York cited a decimated roster as well as Shanahan’s and Lynch’s first go-arounds in their positions as reason to be optimistic. “We’re probably not going to get it all right in the first year, first two years, but this is something we’re going to try to build and I believe we have a very good foundation. I think the future is bright for us,” York said, via NBC Sports Bay Area. Quarterback Jimmy Garoppolo only started three games due to injury, a hit to the offense and overall leadership. He injured his ACL in Week 3. The 49ers added Dee Ford, Kwon Alexander, Jordan Matthews and Jason Verrett via free agency this month. York told reporters they were also “very aggressive” in trying to get Odell Beckham Jr. The Cleveland Browns traded a 17th overall pick, a third-round pick and star safety Jabrill Peppers to land the wideout.